Seven-year scope shows July is hotter than August. The recent surge looks modest, indicating more increases could come. The BTC/USD surged above $7,000 on July 17th, sparking fresh enthusiasm after a few months of declines amid low volatility. There were some fundamental reasons such as Blackrock's interest in blockchain technology, Mastercard's crypto patent filing, and the moves by IBM. Other analysts pointed out a short squeeze: some traders have been caught in short positions for too long, and as prices stabilized, they were forced to exit, sparking a rally. Surprisingly positive breaking news and a surprising break of short positions can explain the rally in the near-term. Yet the broader scope shows that nobody should have been surprised. Bitcoin is the grandaddy of cryptocurrencies, and its relatively long history of price action provides more profound insights. Seasonality may be playing a role. 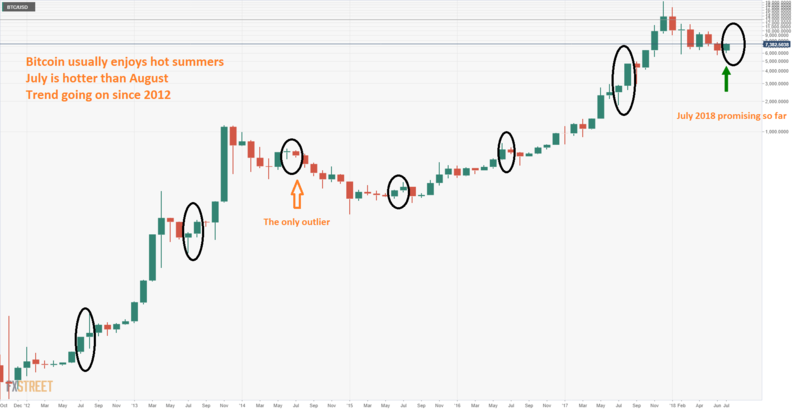 Looking back at the BTC/USD price action since 2012, we see that the summer months of July and August are usually hot: cryptocurrencies are on the rise. The only outlier is 2014, when prices advanced in July but slipped in August, resulting in a "cold summer" for the digital coin. In most years, the cryptocurrency rose at a quicker pace in July than in August. In many countries, August is a slower month as people go on vacation. Nevertheless, 2017 was different, with the explosion coming in August. The graph below uses a logarithmic scale, thus reflecting the changes in prices as they happened, Bitcoin made a convincing break above $1,000 only in 2017. Using a regular price scale does not allow seeing the magnitude of the moves before that year. The logarithmic Bitcoin chart reflects the action in a better manner. As the chart shows, the rise in July is relatively modest. At the time of writing, the BTC/USD has emerged from the abyss and pared the losses suffered in June. In previous years, Bitcoin surpassed June's closing levels in June. And contrary to other things we learned, this pattern has no outlier. So, if the seasonal pattern continues, the recent settling above $7,000 may only be the beginning. Further gains may be seen throughout July. The increases may extend into August if we look at 2017, but looking at the broader scope, the second summer month could be more choppy.